DAYTONA BEACH, FL--(Marketwire - April 29, 2008) - Halifax Health will present Florida's first live online robot-assisted gynecologic oncology case Thursday, April 24, at 7 pm on www.OR-Live.com. Kelly L. Molpus, MD, the area's only gynecologic oncologist, will perform the surgery. Christopher Stanley, MD, will moderate. Stanley is a gynecologic surgeon and the Director of the Halifax Health Gynecologic Endoscopy Fellowship, which offers top level training for laparoscopic and robotic surgery and is the only program of its kind in the state of Florida. Robotic surgery allows more direct control and precision for procedures such as hysterectomies and lymph node dissections. "We are excited to be the first in this area to offer the benefits of such an advanced system," said Stanley. "The da Vinci® offers the benefits of a minimally invasive procedure, which means potentially less pain, less blood loss and a faster recovery time," said Dr. Molpus. "And because of the design of our specialty, we are able to provide continuity of care from surgery through remission. We are able to build strong bonds with our patients and their families, which makes a big difference." Gynecologic oncology is a field of medical specialization which deals with the study and treatment of malignancies arising in the female reproductive tract. Through years of intensive training, Dr. Molpus has learned to perform aggressive, targeted gynecologic oncology surgeries as well as the administering of appropriate chemotherapy. For women needing treatment for malignancies in the reproductive tract, the addition of this rare specialty is good news. "For ovarian cancer, specialists understand that women have a better prognosis if a majority of the cancer is aggressively removed during the original surgery, and we take extra steps to remove as much as possible," said Dr. Molpus. "In other cancers, aggressive removal of the tumor does not usually have the same benefit." The public is invited to attend a viewing at Halifax Health Medical Center's auditorium. Seating begins at 6:30 pm. To reserve a seat, please call 877.8.HALIFAX. Podcasts and vodcasts of the event will be available through YouTube, Google, Yahoo!, MSN and iTunes. 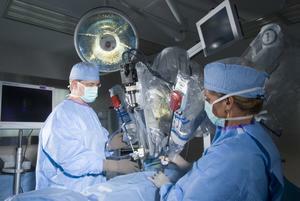 da Vinci® is a registered trademark of Intuitive Surgical (NASDAQ: ISRG). 'The da Vinci offers the benefits of a minimally invasive procedure, which means potentially less pain, less blood loss and a faster recovery time,' said Dr. Molpus.